Don’t you juse love weddings?! So far this year I’ve been had to make a handful of wedding cards and I love doing each one. 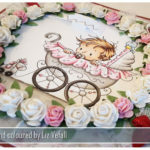 This particular card as made with the request of matching a baby card as they were celebrating both events at the same. On the right side here you can see the baby card I made and if you click on it you will be taken to the post I wrote about that card. 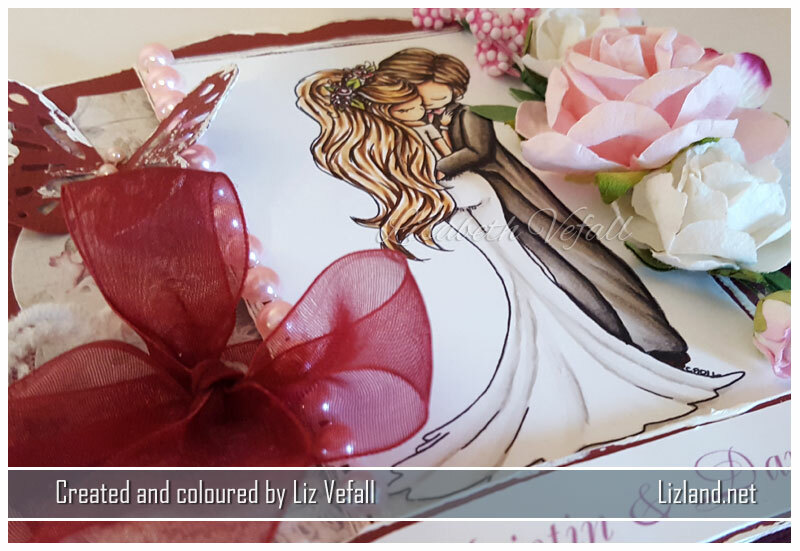 This one is made with my favourite wedding image, from Tiddly Inks and as usual I’ve removed the names that were added at the bottom. It’s been coloured with Copic Markers and I’ve used various embellishments from Wild Orchid Crafts, Live and Love Crafts, Martha Stewart, as well as some acrylic paint and cheese cloth. Happy birthday Jackie! I hope yesterday was a wonderful celebration for you! 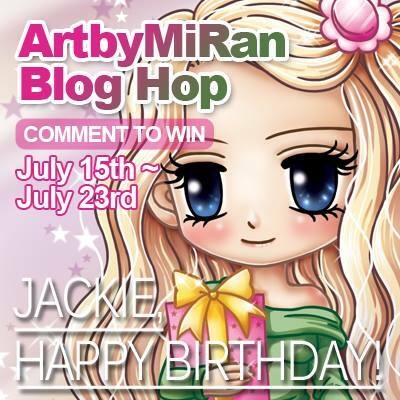 Comment on every stop (including the Art by Mi Ran blog) of the hop for your chance to win 5 Art by Mi Ran digital images! Each blog hop day will have 2 winners. so there are lots of chances to win! Winners will be chosen randomly. You have until July 23rd to comment, and all winners will be announced on the 25th at the Art by Mi Ran blog. 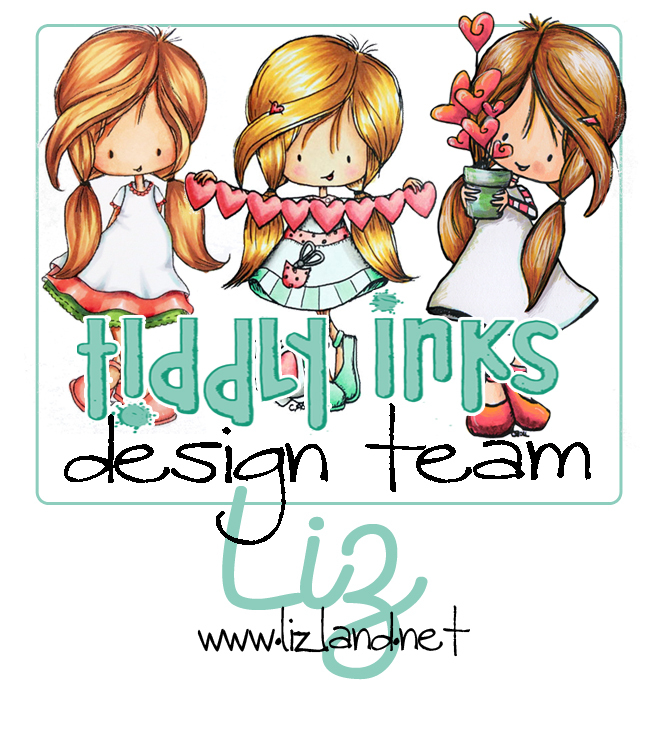 This should be your first step in the blog hop, after the intro on the Art by Mi Ran blog. For the hop, all team members created a birthday card for Jackie. As usual I am one of the last ones to make my card, so I tried to choose an image no one else had used, which is quite hard when so many have made their cards already! I used Mi Ran’s Lady Penelope for my card. The hair was lots of fun to colour and I am so pleased how it turned out! I’ve coloured it all in with copics and used liquid pearls for the dotted effect around the image. I’ve used lace by Live and Love Crafts as well as May Arts. 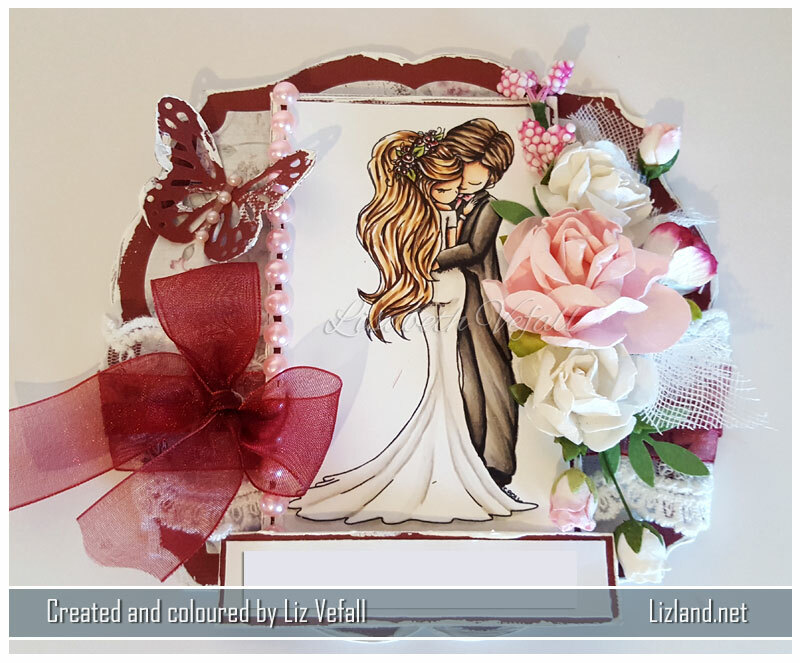 The dies are Noor Design and the flowers are by Wild Orchid Crafts. The sentiment I made myself. Next stop is Jo! You’ll love her wonderful card, I am sure! Don’t forget there is also a celebration for our FB DT co-ordinator Vannessa whose 40th birthday was yesterday as well! Both on the same day, wow! Look here for more details about that celebration, how to obtain the freebie and the competition in the facebook group! 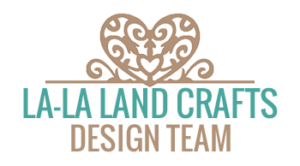 Thank you all for joining us in these blog hop and competition celebrations! Don’t forget it’s another day of the hop tomorrow, you don’t want to miss it! So I signed up for a Christmas Card Swap in the Kit and Clowder facebook group. You make a card for someone random and you get sent one. How exciting! I thought long and hard about what to make and decided on something reasonably neutral colour wise, but keeping with how I tend to make my cards. This is because I have absolutely no idea what the person might like. I decided to go with a winter theme! It seems rather perfect, actually, as it is currently snowing. The first proper snowfall of the year. I sent it off to Isle of Wight on Friday afternoon and believe it or not, it arrived yesterday. Only the Monday after! That is almost faster than sending things domestically, heh. 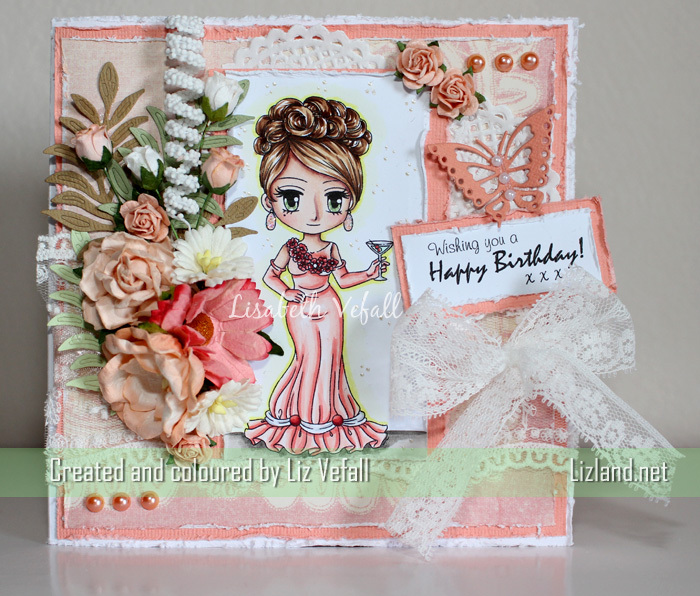 I made a card using my new Noor Design dies. I I have used the following Noor! 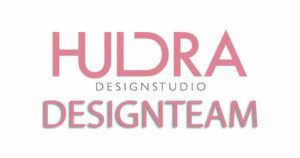 design products: Ice Crystal no.1, Ice Crystal no. 3, Ice Crystal border and border die 0357. 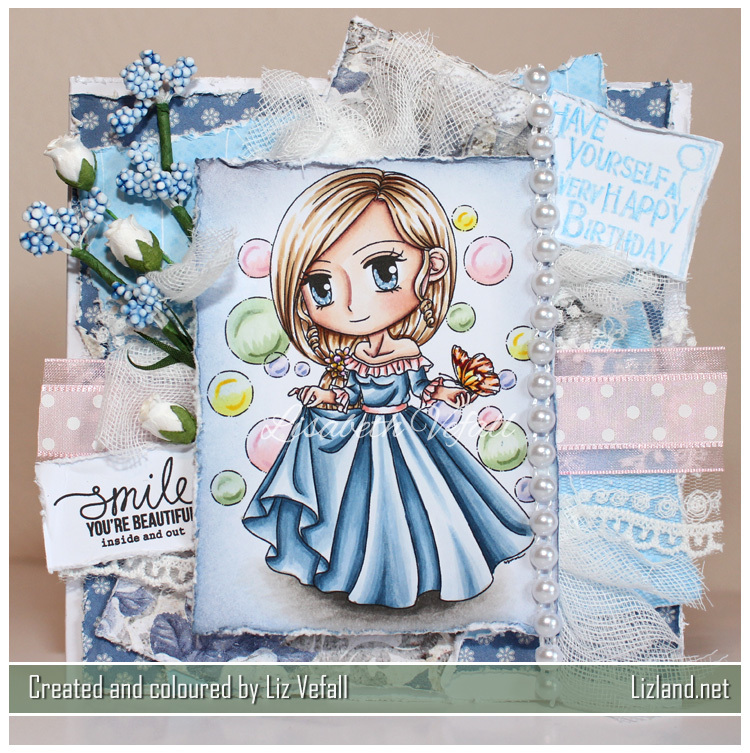 For the image I coloured in my most recent Lili of the Valley stamp, called Cold Hands Warm Heart. The two snowmen holding hands are so cute! I used copics for this. I felt I had to colour something in as it was a part of Kit and Clowder which really is all about teaching how to colour! (Excellent classes btw, do try them if you haven’t!) The ribbons, pine cone and flowers are by Wild Orchid Design. I have an essay due tomorrow, so rather than write it I figured I would make a card! Inspiration generally comes flowing when you have other far more important stuff that needs to be done. It worked like a dream! 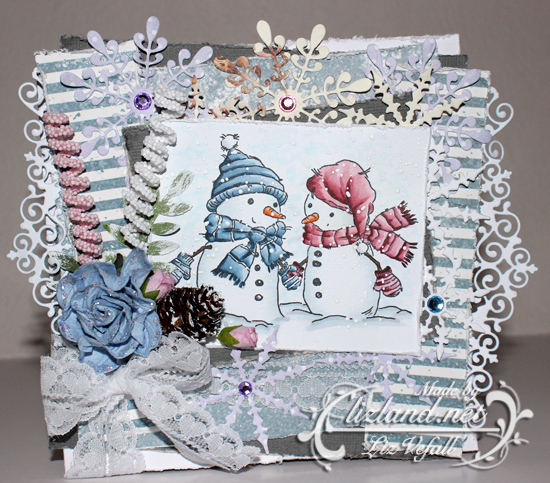 This card took no time at all to make and I am quite pleased how it turned out. The papers are from Papermania. When I was on holiday I was set on not purchasing anymore paper as I really do not need anymore of it. That plan lasted until I spotted this gorgeous paper pad! The adorable pre-coloured image is from The Hobby House. All the flowers are from Wild Orchid Crafts along with the lilac ribbon and bow. The lace is from a local, the sentiment stamp from Lili of the Valley. I reckon the doily might also be Papermania, while the cute little buttons on the side are card candy from Craftwork Cards. The leaves are made using a Martha Stewart puncher.